Terrorists increasingly manifest their existence in Kazakhstan. So far they target representatives of the law enforcement and governmental bodies. As reported earlier by Fergana, on the 12th of November, as a result of bloody tragic events in the town of Taraz (formerly Jambul) in the south Kazakhstan, caused in accordance with the official information by a single terrorist Maxut Kariev, an adept of Jihadism, who first shot two officers of the national security department in the Zhambul province that had had him under surveillance, next he attacked an owner of a Mazda vehicle, and then he raided an arms and ammunition shop, killing a security guard and an accidental shopper, whereupon he collected two semi-automatic rifles and ammunition, and killed two policemen who followed him; then he returned home, picked his own grenade launcher and headed towards the local office of the nationals security service and opened fire at the building’s walls and windows, injured two horse police patrollers, who were actually unarmed. Finally he was wounded himself and apprehended by road police officers. He then shot another police officer, injuring him, and finally blew himself up, killing a police captain who attempted to disarm the criminal. Three other policemen were wounded. explosions. That same day, police prevented another blast in the center of Taraz, while somewhere on the outskirts of the town, a police checkpoint was attacked, leaving two more policemen killed and their weapons picked by criminals. 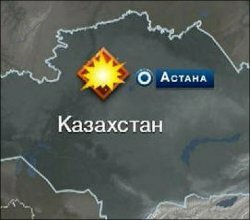 Earlier, on October 31, two other explosions shocked the city of Atyrau in the north of Kazakhstan. An explosive device was discovered in a training center of an oil company "Agip", where one of the suspected terrorists worked. Just a week later, two policemen were shot dead in Almaty. The assaulters were arrested. It was found they were also committed to the extremist Islamic ideas, who were filming the act of murder, perhaps as an evidence for potential sponsors. An independent journalist Sergei Duvanov (Kazakhstan) believes that "you only become a terrorist a moment after you have committed a terrorist act, but can not be considered as a terrorist before that”. As a rule, conspirators never get left alive, while remaining suspects continue to be tried behind closed doors. All this occurs against the background of mass hysteria surrounding terrorist threats thus giving the security forces a chance to refrain from reporting their actions: their ultimate goal is to demonstrate the state’s ability to respond to any challenge. Yet, less than everyone is content with the version of Islamic terrorism. In addition to claims about involvement of the official Washington allegedly unhappy with strengthening Eurasian Economic union, the opposition and the authorities have also exchanged accusations: the former accuse their opponents in escalating the situation in the light of upcoming parliamentary elections, while the latter claim that some of the oppositions in exile attempt to rock the boat resorting to terrorists’ services. However, I would not blame it all on the government for a simple reason: in the particular case of Kazakhstan, terrorists have targeted law enforcement and other governmental bodies rather that the general public. A few months ago, a fatwa proclaiming a jihad against police in Kazakhstan has been issued and disseminated. The idea of a war against the authorities in the country has also been manifested by a previously unheard-of organization of “Soldiers of Khalifat” that has already accepted responsibility for blasts in Atyrau and alleged of its involvement with the events in Taraz. It’s hard to say whether and how much public believes in existence of such an organization, but people are greatly concerned with what they see and hear and afraid to be affected by the wave of repression. Some three weeks ago, I on occasion talked with an elderly Muslim woman from a suburb of Atyrau, who arrived in Alma-Ata in the "search for truth." Speaking Russian very poorly, she told me of living along with her little son. "Every week, [national security] committee people break into our house, searching for the literature. I am not wearing my hijab anymore, but they keep on coming” - through the tears she said. I was shocked with the medical documents she presented: her son had a serious illness, but, according to a woman, he was denied treatment in a hospital, and one the documents she showed actually had a small inscription on reading “son of a Wahhabi”. "But once I quit wearing hijab, and asked to be issued a new medical certificate, the attitude has changed”, she said. Some time ago, there were leaflets disseminated in certain regions of Kazakhstan, complemented with spam on internet, warning of Wahhabis’ plan to sacrifice a number of children on the day of Qurban bayram. Efforts have been made to calm people down, but the avalanche of panic has already been launched: may parents kept children at home for a week, without letting them go to school. In addition, before and after the events in Atyrau and Taraz, the whole country was struck by a flurry of phone calls with false reports of a bomb threat; in few cases, dummy devices or suspicious packages were found, unlike ordinary telephone terrorism. Rumors are not always completely ungrounded. In September, some 12 persons involved in terrorist activities were tried and convicted in Almaty. This was, perhaps, accidentally disclosed by Ms. Gulzhiyan Suleimenov, chief of the regional department of interior. The incident has triggered a wave of reports from bloggers and participants of online forums about police operations to apprehend terrorists, seize explosives and demine bridges in various parts of the country. In most cases, any official information is missing, so it is difficult to tell the truth from lies. Besides, religious extremists are often reported as regular criminals. National security committee is rapidly losing the very last remains of its past credibility but still prefers to keep silent, as a rule. round table discussion on terrorism last week in Almaty. Sergei Pashevich, a veteran of a war in Afghanistan, and the chairman of "Combatants’’ brotherhood" spoke very bluntly: "Terrorism-related attacks tend to be presented as regular criminal activity. National security committee makes use of police forces which are not properly equipped in order to fight terrorism." Statements of his colleagues has been summarized by Dosym Satpayev, the director of a "Risk Assessment Group,": "The covert war against extremism has entered an open phase. Recent events show that neither the central nor the local authorities are ready for the manifestations of terrorism, just as the rest of the country. Besides, the authorities miss the strategic initiative." It has been long discussed that the terrorism in Kazakhstan may be rooted in the social ground, just as the oppression against untraditional Muslims, yet the official Astana is not prepared to accept this idea for a time being. Anyway, so far the government has adopted its old tactics of fighting the aftermath, refraining to repressions and keeping silent about the problems. Meanwhile, covert terrorist organizations are already in Kazakhstan and are not inclined to remain idle.